The world is under attack! Our enemy is relentless and it’s up to four of the earth’s greatest minds to save our planet from alien invaders. In Fortified you control one of four uniquely skilled characters and lead an army of diverse troops and structures against waves of alien foes. The storyline doesn’t get much deeper than that. The game controls in the third person but mixes elements of tower defense and role playing games. It has a 12 level campaign set in the 1950s that can be played solo or in online co-op with friends or strangers. The goal of each level is to protect your base, which is a giant rocket, from waves of aliens. If your base takes too much damage it will be destroyed and its game over. If your character dies you will respawn after five seconds. Finding the right balance between character placement and equipping the most effective weapon is the main challenge of each mission. The Captain is a solder character that has access to the most fire weapons. The Rocket Scientist specializes in dealing explosive damage. The Agent is a mysterious spy especially effective against large enemies. And the Spaceman is a space cowboy who is uses ice and slowing equipment to control the Martians. When battling together online no one character feels more powerful or weaker than the other. The difficulty is increased noticeably as opposed to playing solo and when all the different support troops are working together it is really fun to watch. Fortified’s controls are intuitive and easy to remember after a few levels of play. At the beginning of each level is build mode. The game shows you the enemy spawn points on your minimap as well as their path and it’s your choice where to set defenses. Rifle infantry or rocket trooper? Heavy mortar or anti-tank gun? You make the call and can adjust accordingly between waves. You are limited by the amount of cash you start with, as each support character or structure costs money to place. After each wave you will earn more money and you can add or remove things. You get full value back when removing them and it really is necessary in the later levels. As the main character you are free to run around the map and attack enemies wherever you desire. If your base gets attacked, you will hear a noticeable alarm and you’ll have to rush back and kill the enemy or order your troops back to base. Once you’ve defeated enough enemies your heroic power meter will fill and you can unleash your special attack by clicking both thumb sticks. For example, The Captian can call in powerful artillery strikes and the Rocket Scientist can fly around the map with unlimited ammo. Saving these attacks and knowing when to use them can be the difference between victory and defeat. As you complete missions in the game your character earns XP and levels up. With each level gained you earn unlock points which allow you to unlock new characters, weapons or upgrades for both. If you’ve played any Borderlands games these upgrade trees will seem familiar. At any time you can respec (undo) your upgrades and get all your credits back without penalty. I never had a use for the attractor, a powerful magnet that attracts smaller enemies, through the first six missions. When I finally needed it I was able to unlock and upgrade it, at the expense of another structure that wouldn’t help me. This is a great inclusion by developer Clapfoot because different missions require different strategies. The solo missions are fun, but online co-op is where this game will keep you engaged long term. I found it fun to replay levels I had previously beaten with three other characters. It never feels like a waste of time because all the while you are earning XP that will help you out when you resume the solo campaign. Maxing out each character at level 20 will take a sizeable investment of time. Unfortunately, you cannot switch characters before your mission unless you’ve previously reached that mission with said character. For example, stuck in level 7 with your Captain? You can only switch to another character if you’ve beaten missions 1-6 with them. The reason makes sense; a fresh level 1 character will not do any good in a late game mission. Starting back at mission one will allow you to learn the ins and outs of the character gradually. This helps expand the overall game time and replay value. Graphically the game has a vivid cartoonish art style that fits perfectly with the setting. The characters and artwork look straight out of 1950s political propaganda. The in-game graphics aren’t breathtaking but they don’t detract from the experience either. Fortified’s art style reminds me of Team Fortress 2 or Battalion Wars. The game runs smoothly for the most part, even with many characters on screen at once. I did notice a hiccup whenever the Juggernaut, a building size robot Martian, finally defeats your base. Also playing online does feel slightly slower than playing solo. Gameplay is fun, tense and gratifying. As chaotic as things may get with enemies coming from all sides, you never feel out of control. The feeling of finally beating the Juggernaut after hours of trying was a definite highlight for me. There are three difficulties: normal, hard, and insane. I would have enjoyed an easy difficulty as well because the campaign does get quite difficult about halfway through. The A.I. is functional but not as responsive as I would like. You can turn troops to face different directions in build mode, but sometimes they seem a step too slow when reacting to the enemies. The most annoying has to be the auto turret; which can attack in 360 degrees but will always face the direction it was last shooting. Meaning you can start a new wave and that turret might be facing away from the enemy. You can turn the turret during build mode but that requires several button presses to sell and then respawn it. If the turret would just spin in a circle it would solve this problem. I also wish the main characters, enemies and support characters showed more personality. I expected to hear lots of cheesy one-liners from the heroes, mindless banter or menacing threats from the enemies. Instead we get a repetitive line at the beginning and end of each wave from the main character. It seems like a missed opportunity to add more humor or story elements to the game. 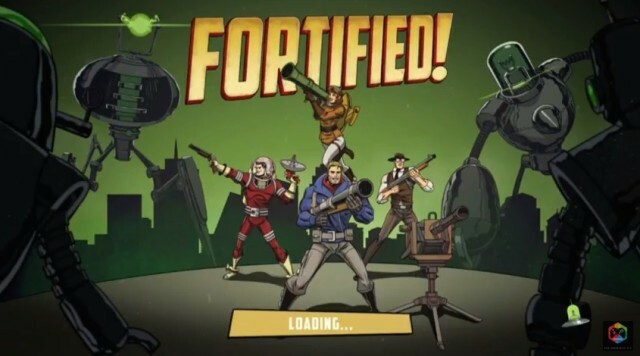 Despite a few small complaints I was pleasantly surprised by Fortified; it’s like nothing I’ve played on Xbox One to this point. It looks and plays well but most importantly it’s fun. Playing levels over with new characters or unlocking powerful weapon modifiers got me hooked; and the online co-op will keep me coming back. If you’re a fan of third person action or tower defense games you really can’t go wrong with Fortified.